Making your brand bigger and better online doesn't have to be hard. In many cases, the solution is finding the right digital marketing company to grow your brand in the internet sector. One of the best companies on the block is Huemor Designs. The web design and development services provided by the talented marketing professionals of this progressive firm will empower you to share your brand with online audiences in a dynamic, engaging manner that metabolizes conversion while also making product loyalty more likely. One of the reasons that this team is so effective in generating substantive online growth for businesses pertains to their holistic approach to web design and development. In addition to optimizing sites for factors like mobile friendliness and functionality, the team's techies work with diligence and dedication to optimize sites for engagement, relevance, and innovation. 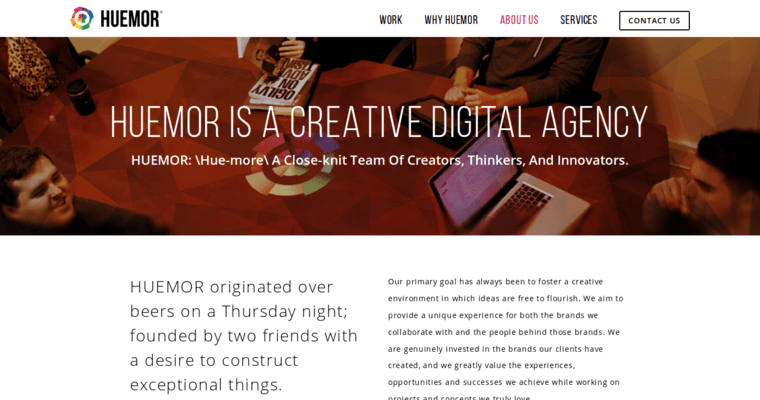 If you're ready to make your website so cutting edge and creative that you consistently leave competitors wondering what happened to their business, choose Huemor Designs.